Black Ice Software - Print2Email version 10.08 is released! 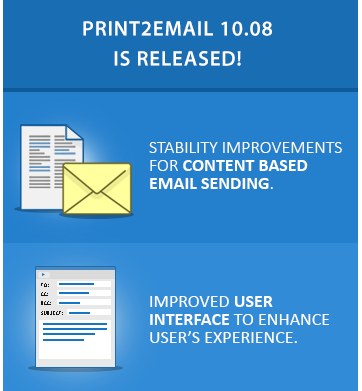 Print2Email version 10.08 is released! Stability improvements for Content Based Email Sending and more! Black Ice Software has released version 10.08 of the Print2Email. This version includes stability improvements when printing certain documents with Content Based Email Sending, including PDF files generated by Microsoft Word and Web pages. The improved Content Based Email Sending can be used to extract specific information (For example: email subject and recipients) from the printed PDF document or Web Page and send the email based on the extracted information without any user interaction. This can save employees valuable time when attempting to send documents. The latest Print2Email also includes user interface improvements to enhance the user's experience, along with stability improvements when importing contacts from a Yahoo Address Book.